One of my closest friends (and fellow mom) is not exactly “green”. She tends to skew towards the tested and reliable brands and not towards the “fad” of baby organic products. I recently persuaded her to try a few organic products and, low and behold, she has been very pleased with the results. So … here are a few tips to getting your parents, friends, mother-in-laws and other skeptics to slowly embrace healthy alternatives. 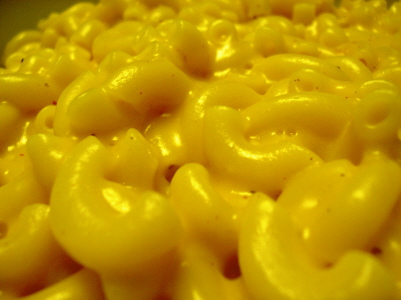 Organic mac and cheese. Easy. It costs a tad more than the standard (and Kraft now offers an organic version), but the argument against that unnatural orange color was enough to convince my skeptic. She tried Annie’s Organic and said her son happily gobbled every last bite. Eco-friendly dish soap and dishwashing detergent. This one took a bit of selling on my part. I went out and purchased a bottle of Seventh Generation dish soap (citrus scent) and left it at her house. After a few days of trying it (and reading the back of the bottle) she agreed that it was nice to be able to pronounce all the ingredients. Eco-friendly sunscreen. Being fair-skinned herself, she was no stranger to purchasing large amounts of sunscreen. I emailed her the health report of popular sunscreens at the Environmental Working Group’s site. And sent her a link to Jennifer’s great post. She was horrified to see the rating of the product she regularly bought and slathered all over herself and her son. I’m convinced that once you start educating yourself and others there is no turning back. Next on my agenda is getting her to replace one produce item with an organic version. What are your tips to converting stubborn friends and family? Photo Credit: Creative Commons license by Jspatchwork on Flickr. We recently went 180′ with food. No food coloring, no artificial flavors, no preservatives. It was difficult in the beginning, but for only $50 more a week, we are eating free of all these poisons. Our new favorite dish? Chicken/cheese quesadillas with organic whole wheat tortillas, shredded organic chicken breast (only takes one breast), with organic cheese, and dipped in organic sour cream. This meal was about $20 total, feeding my husband and I and our six kids. Another easy switch? Ditch the orange (food coloring makes them orange)cheetos and trade them for their natural white cheddar ones. They are so much better!! Rocky, thanks for the tips. I love quesadillas. Since I had my daughter about a year ago, organic living has become a big part of my lifestyle and work. What has surprised me most is that some of my friends and family actually believe there is some value to the pesticides in produce. The believe it kills germs that makes it safer for them to eat. Unfortunately the pesticides can kill a lot more than insects. I’m hoping that as I am consistent over the longterm that the questions and conversions will continue. I use natural cleaning products and serve organic meals when they come over and give organic versions of gifts on special occasions. One thing on our side is that organics (well chips are sometimes weird) do taste better. Even my one year old knows the difference. One of my best friends is totally not green. She is just skeptical, like a lot of people, and the best way I have found to get her to try a little greenness in her life is time and just being an example. This week she was proud that she tried cloth bags. And this was a huge step for her.